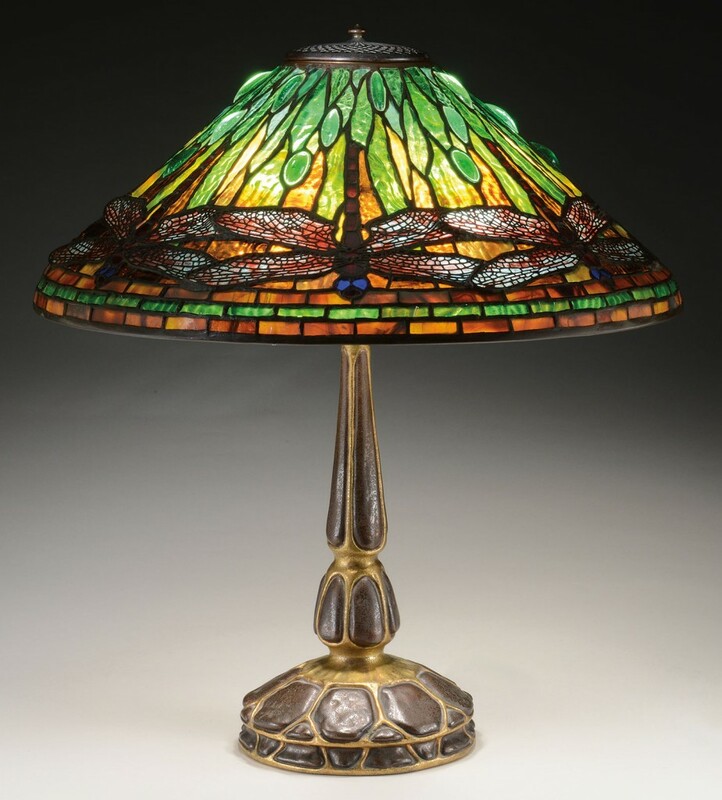 James D. Julia’s annual Late Fall Auction – slated for Friday, December 1st, online and at the firm’s gallery in Fairfield, Maine – will contain over 750 lots of lamps, glass and fine jewelry items, many of them rare, museum-quality pieces, just in time for the holiday shopping season. The sale will include highly vetted examples from brands such as Tiffany, Daum Nancy, Lalique, Galle, Handel, Amphora and others. 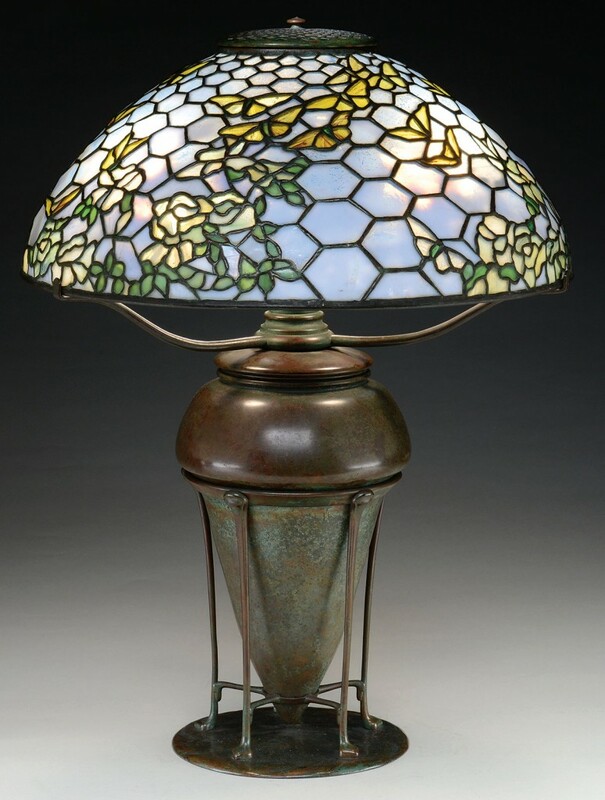 There will be over 60 lots of Tiffany fixtures alone, to include a petitely proportioned Rose and Butterfly table lamp and a Dragonfly table lamp. Both have pre-sale estimates in the $60,000-$80,000 range. 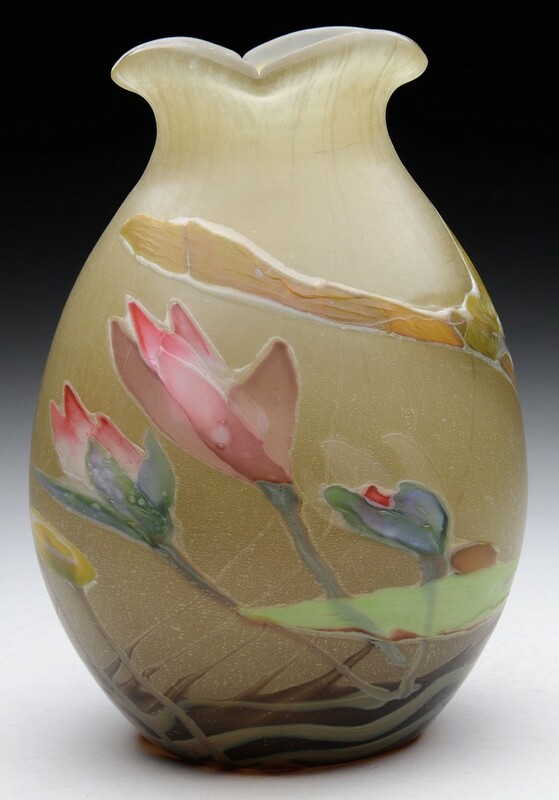 Also up for bid will be antique lighting from other top-tier American and European brands, including Buffalo Studios, Suess, Bigelow and Kennard, plus over 20 quality Handel examples; cameo art glass, to include a Galle marquetry Nenuphars vase and pieces by Thomas Webb & Sons and Schneider; distinctly decorated French vases; more than 60 temptations of fine porcelain and pottery; decorative desk and metal accessories; and other items, to include modern glassworks, precious jewelry and other fine antiques. It’s a diverse inventory, with something for everybody. The sale will get underway at 10 am Eastern time. For more info, click here. 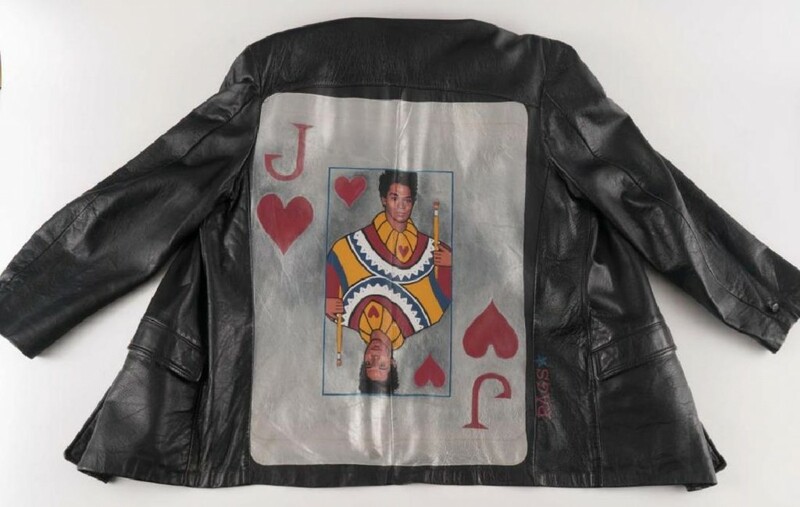 An attic find of original artworks which includes some by Andy Warhol and Jean-Michel Basquiat – literally unseen by anyone since being stored away more than 30 years ago – will finally see the light of day in an auction planned for Saturday, December 2nd, by John McInnis Auctioneers, online and in the firm’s gallery at 76 Main Street in Amesbury, Mass., starting at 1 pm Eastern, as part of their two-day sale of the contents of the Harriett (Woodsom) Gould estate, the family country home in Amesbury. Mrs. Gould was the mother of Jon Gould, who was a close friend and confidante of both pop artists. 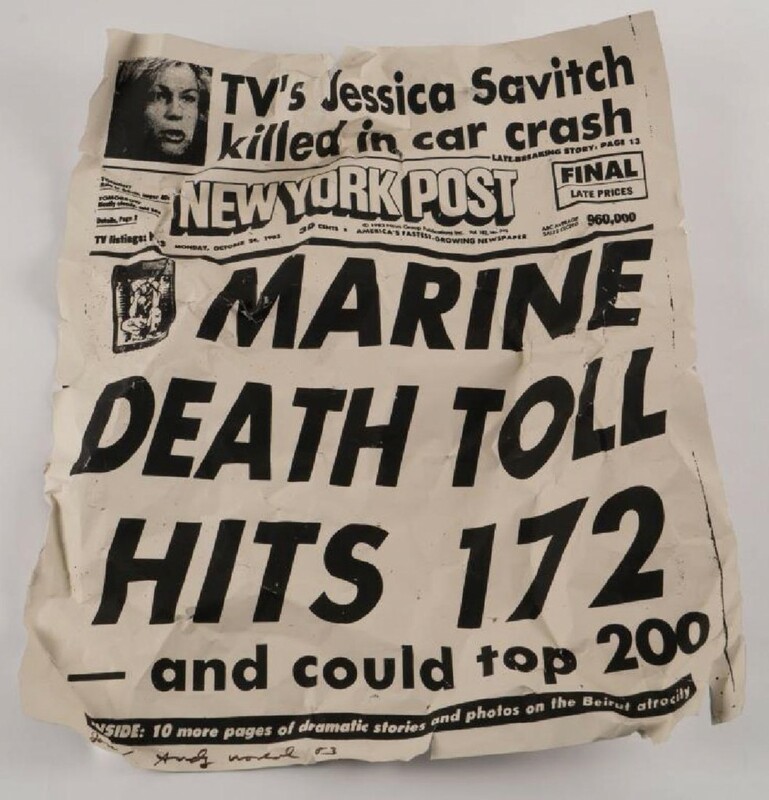 The artworks, plus other items relating to Warhol and Basquiat and other art luminaries of the era such as Keith Haring and Kenny Scharf, were only recently unpacked now that the home is to be sold to settle Mrs. Gould’s estate (Mrs. Gould passed away in December). 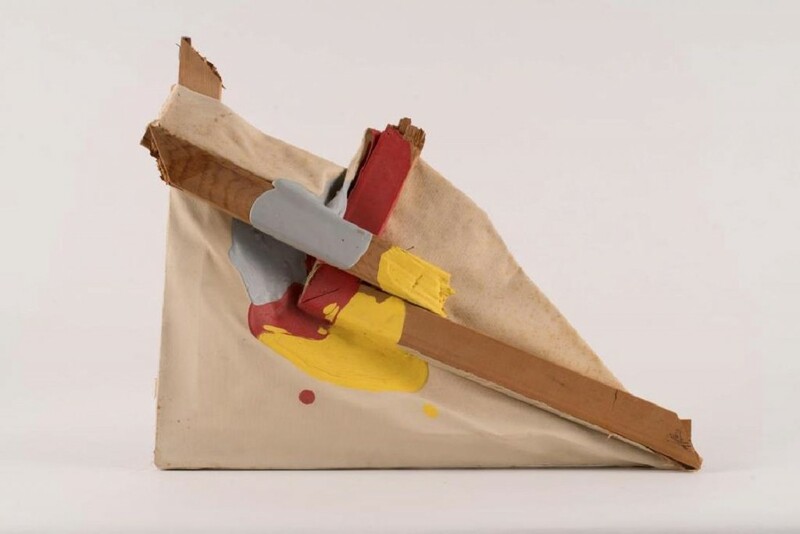 Jon Gould died at age 33 in 1986, six months prior to Warhol. He led a double life of sorts, one with Andy in New York City and another in his work life in Los Angeles. He held a high-power corporate job as vice president at Paramount Pictures in Hollywood. But in his other life, he was a major part of the ‘80s New York pop art scene. 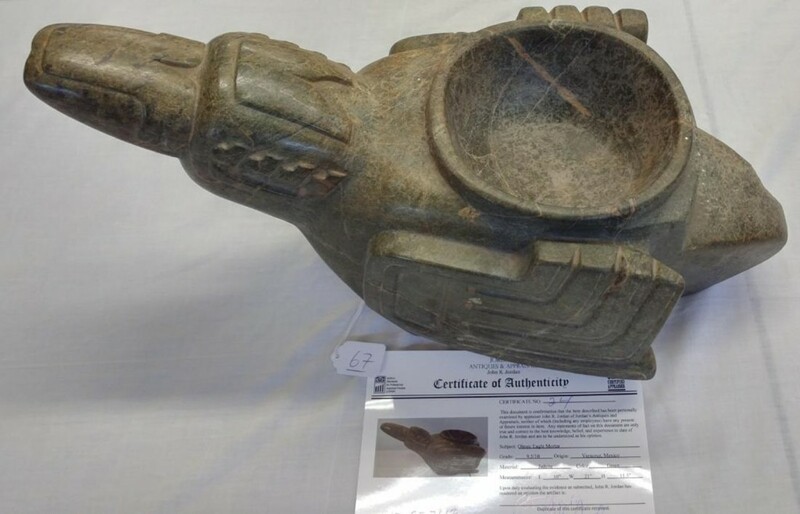 Boasting one of the largest consignments of pre-Columbian stone artifacts in a single catalog, Helm Auction of El Cajon, California will conclude 2017 in grand fashion with a 450-lot, all-day, online-only auction Saturday, December 2nd. It promises to be Helm’s largest sale to date, ever, featuring an array of tribal and Native American art and artifacts. 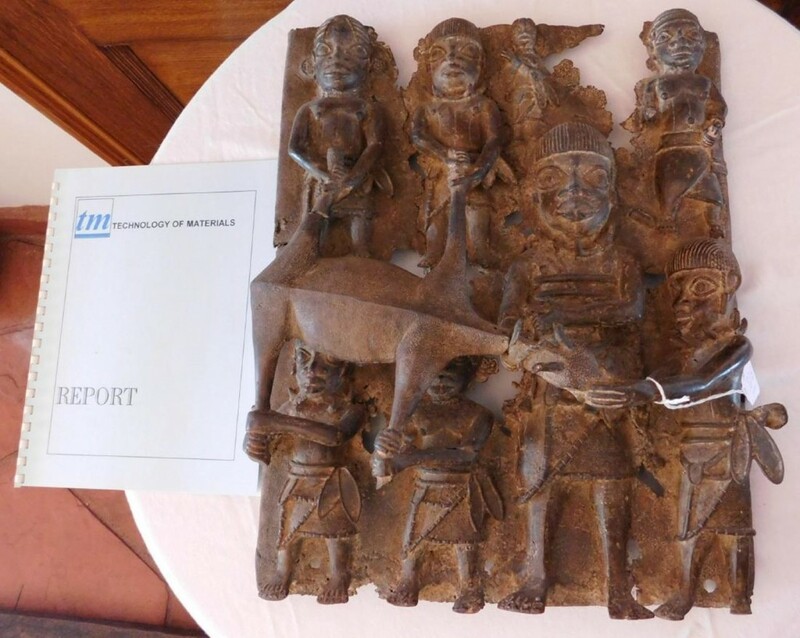 Offered will be rare pre-Columbian objects such as Aztec and Olmec stone masks and figures, Mayan stone and pottery, and a large grouping of early 20th century African art and older African bronze pieces. The auction will begin at 1:15 pm Pacific time. 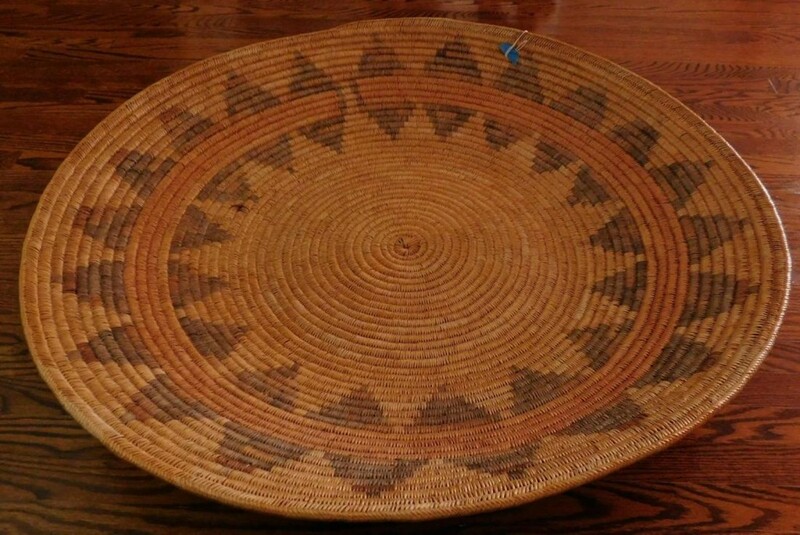 Other consignments include Native American and Mexican jewelry, Navajo weavings and pueblo pottery. There is a small grouping of Polynesian artifacts, and many pre-historic stone items such as California and Midwestern arrowheads, pipes, axes, game stones and more. Bidders can sign up online to bid live and place absentee bids at live.helmauction.com, or go to one of the firm’s partner websites, LiveAuctioneers.com and iCollector.com. Helm Auction, Inc., is owned and operated by Diane Harvey and Craig P. Helm, Sr. The firm specializes in Native American object and antiques, as well as tribal artifacts. For more info, click here.